Kengo Okada (Yutaka Takenouchi) works at an aquarium. He has a secret to keep if it means sacrificing everything he has. roberthstiver Mar 18 2018 12:28 am I really, really liked the TV drama "Nagareboshi" when it aired, with English subtitles, in Hawaii in (?) 2013. I thought Ms. Ueto's and Mr. Takenouchi's acting superb throughout, and the romantic suspense made my old heart ache! Daisuki deshita! Kris Jan 20 2018 7:40 pm This is such a touching story. I'm just sad there wasn't much admission of the main characters' feelings for each other. :))) Despite the age gap, Aya and Yutaka has such great chemistry. Aya is so beautiful and so is Yutaka. ace Oct 15 2014 9:43 pm While I cannot say much about the script, the acting and direction were pretty good. It held my interest most of the time. non sibi Sep 25 2011 12:29 pm I am watching this drama. To watch Jdramas love story is like putting oneself in a pressure cooker, very heavy and very tense. Nijika Aug 19 2011 3:26 pm I love this drama a lot too,,, just like Kanuna said. Love Yutaka and Aya here!!! 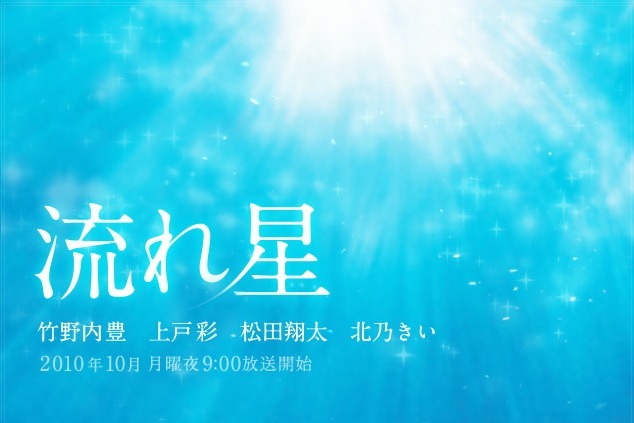 Futari no dorama ga zutto matteiru kara :) Kono dorama de, dakishimeta toki futari no kanjou ga kanjiteru kara, totemo daisuki desu!!! Kanuna May 28 2011 9:30 am I love this drama a lot, Yutaka and Aya are great acting in this drama! Two thumbs for them ! Ganbatte for Yutaka and Aya ! Ida Dec 02 2010 9:24 pm i'm pretty sure, ueto aya will win some awards for this drama. her character was so different from her previous dramas & movies and she did too well!! ganbatte aya chan! !